Cowboy shows a picture of himself being held by his mother when he was about six months old. He thinks that by the time this picture had been taken, he had already traveled through most of the southern United States, and some of Mexico, before heading to Muskegon County, where his parents’ families were based. Thomas Hardy, also known as Cowboy, was homeless for 54 years of his life. Cowboy was a drifter from birth; his father moved the family of five children around the United States to find work or escape the law. The family would occasionally visit Muskegon County, where Cowboy’s maternal and paternal grandmothers lived. 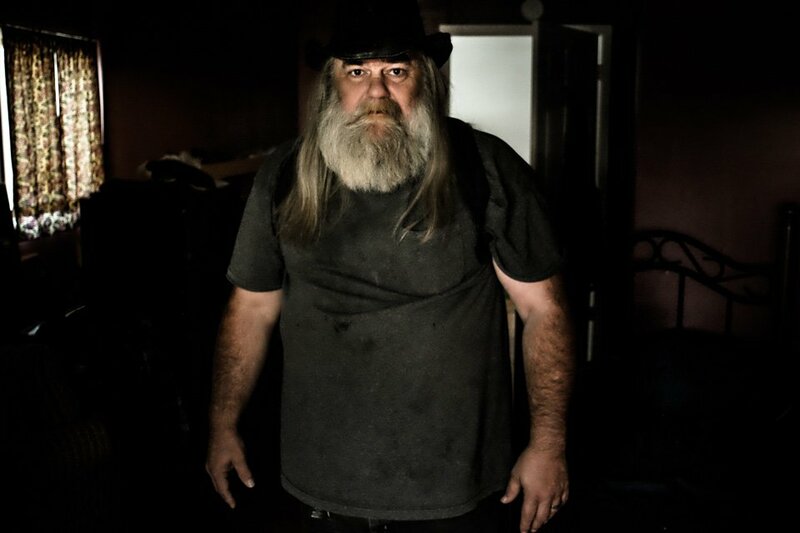 As Cowboy came of age, he continued to live the life he was brought up in—working odd jobs, collecting scrap metal and sleeping in the woods—until his health finally gave in and he had to seek stable housing in 2013. 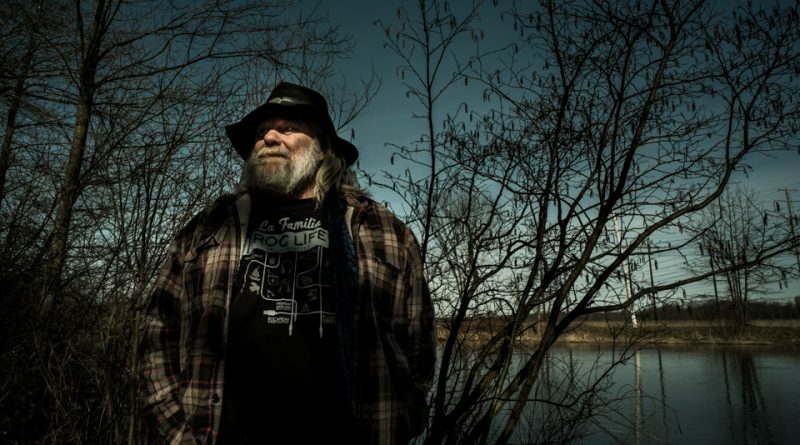 After returning to Muskegon to be close to his family five years ago, he joined Community enCompass’s Sacred Suds and soon after found permanent housing in the city. Sacred Suds is a community center based in Muskegon’s McLaughlin neighborhood that provides laundry and shower facilities, food, and technology resources for anyone who needs them. 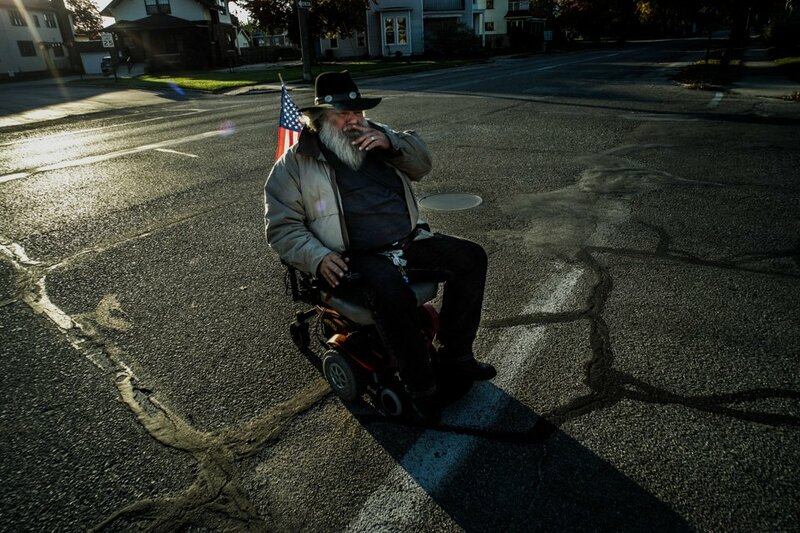 Cowboy has resided in Muskegon since 2013, the longest he has ever lived in any one place. Today, Cowboy puts his life experience and his passion for the homeless and vulnerably housed to use as an outreach coordinator for Muskegon County through a local nonprofit, Community enCompass, a neighborhood development organization. 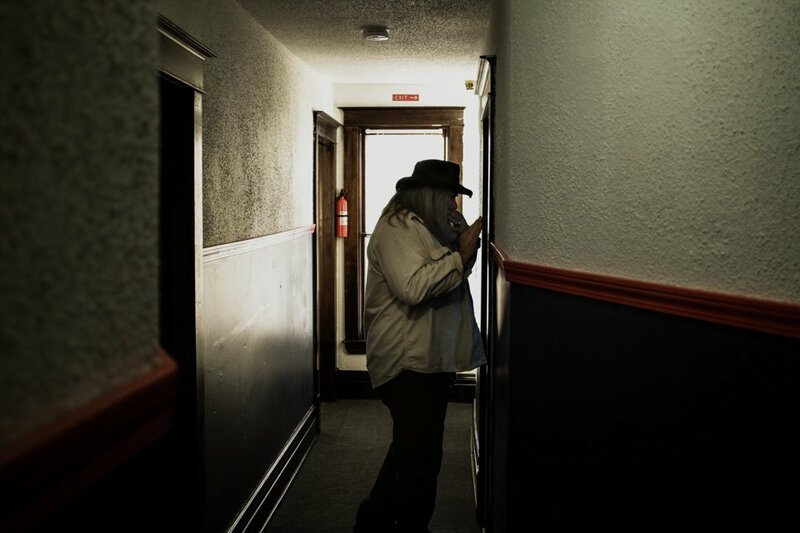 On call around-the-clock, Cowboy works to connect homeless and vulnerably housed individuals to the community and much-needed resources. “I will continue working what I do, to help someone out that is in the same position that I grew up in, homelessness,” he says. Cowboy sees the obvious solution to easing homelessness as affordable quality housing and local steady jobs that pay a livable wage. He dreams of a day when jobs like his will no longer be needed, but, until then, he will continue to help those in Muskegon County who are living the life he once had. Cowboy poses in his bedroom for a portrait. “The last thing I have of my father, except for my height, is my looks,” he says. Cowboy’s father believed that God had come to him in a vision and had commanded him to physically, sexually, and emotionally abuse his children. Cowboy has finally been able to accept the abuse that he suffered at the hands of his father, even being able to forgive him, but he will never be able to forget. His experiences as a child have deeply shaped who he has become and the work he now does. 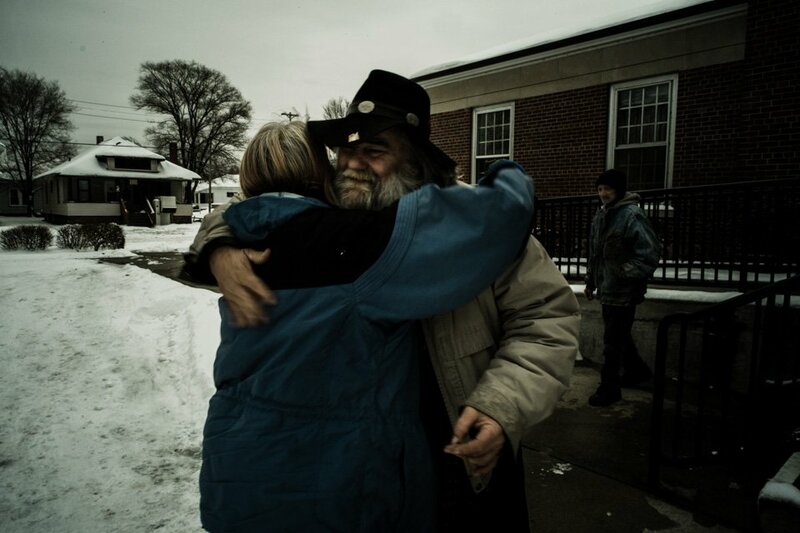 Cowboy visits with a friend at Muskegon’s Patriot House, a homeless veterans housing unit at which he once supervised. Between 1977 and 2013, Cowboy worked odd jobs to support himself. In that time, he became a recovering alcoholic and recovering drug addict, lived on the highway, rode box cars, and hitchhiked. Cowboy drives a scooter donated by a member of the Muskegon chapter of Rolling Thunder, a local veterans biker group. The scooter is Cowboy’s main form of transportation until the snow gets too heavy; then, he relies on the help of friends and family to get around. Cowboy suffers from arthritis, emphysema and epilepsy. The combination of these three health conditions finally pushed Cowboy to accept help in finding housing. If he hadn’t sought out housing, Cowboy thinks he would have died on the side of the road from a mixture of the three conditions. Cowboy stands next to the north branch of the Muskegon River. 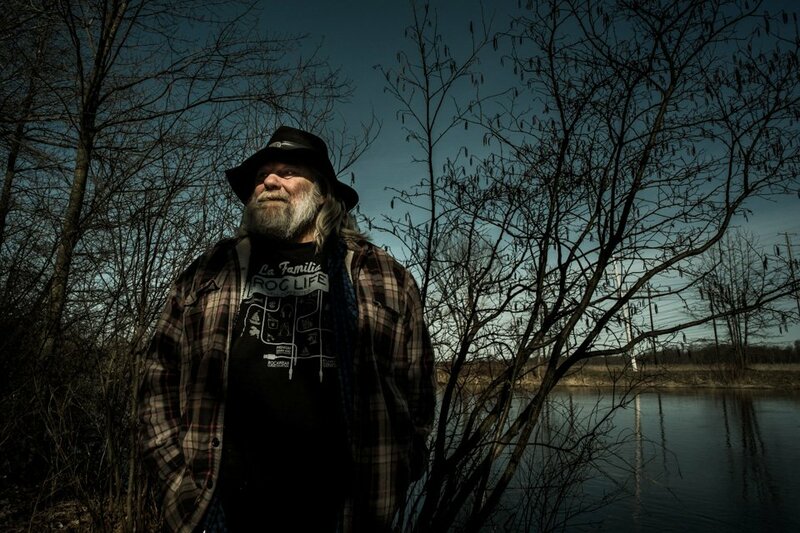 Cowboy’s last camp site before finding housing was next to the Muskgon River in 2013. Every morning, he would wash in the river before heading into town to volunteer at Sacred Suds. Cowboy loves the outdoors. When he was homeless, Cowboy would set up camp in wooded areas, in part to keep away from housed people but also to enjoy the peace and quiet nature provides. Cowboy misses the freedom of being a drifter, being his own boss, and being free to live the way he wanted. Cowboy comforts a friend seeking housing resources at a weekly community breakfast offered by the First Congregational Church. Within the homeless community, there is a lack of trust of anyone housed; most homeless people have experienced physical and verbal abuse from housed people based on their current life situation. That lack of trust leads people to further isolate themselves and not go looking for available help. To add to this, the bureaucracy that surrounds housing people is so complex and slow-moving that it often leaves homeless people feeling even more ignored. Cowboy often finds himself acting as cheerleader, urging people mired in the system to stick with it. 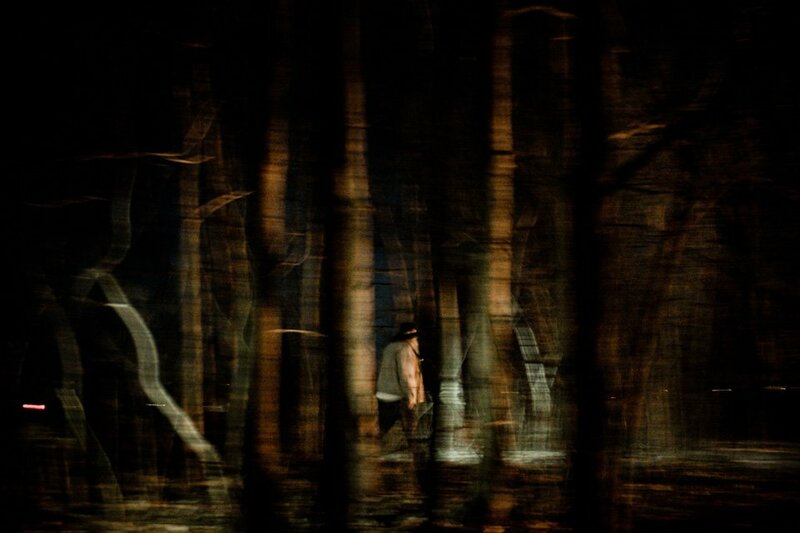 Cowboy looks for homeless people in the woods surrounding Muskegon. Due to the mistrust and fear many homeless people feel towards the housed, numerous individuals will often camp out in the woods to be left alone, just like Cowboy once did. Due to this, part of Cowboy’s job is to make contact with people camping in the woods so he can build trust with them and connect them to services they may need. An old friend from Sacred Suds and the First Congregational Church community breakfast embraces Cowboy. “The Good Lord allowed me to go through what I went through, which is 54 years of homelessness, [being] a recovering alcoholic and cross addicted drug addict, being sexually and physically abused, growing up to work with and minister to the street homeless. I know what they’re going through; I’ve been there; I know where to go looking for them,” Cowboy says. 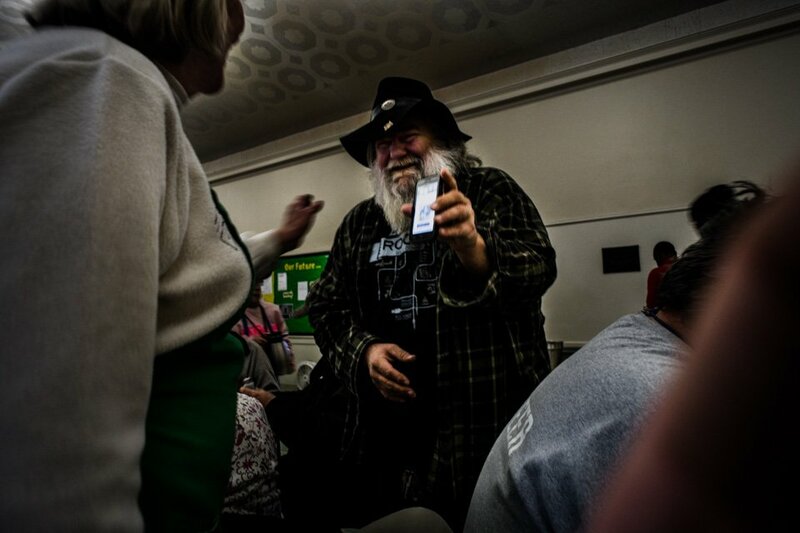 Cowboy jokes with a volunteer at the First Congregational Church community breakfast during the winter of 2017. 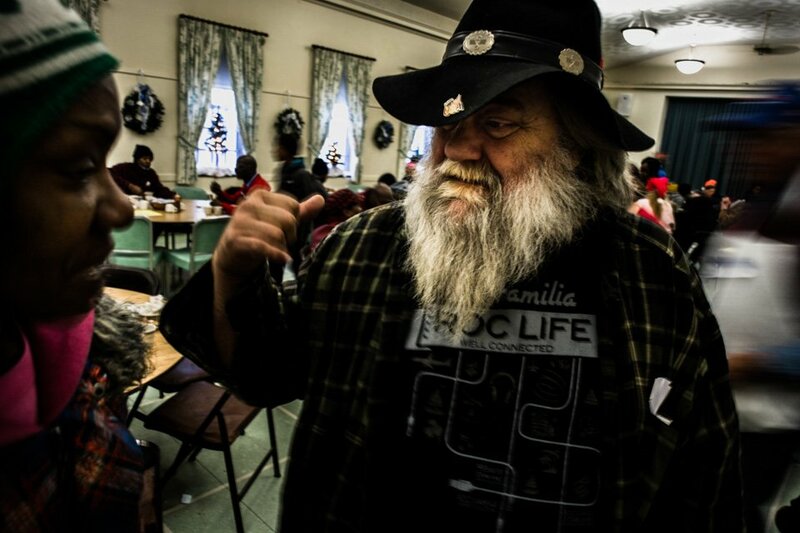 He has become a small celebrity among the homeless community due to his openness and humor. The average story Cowboy comes across within the homeless community is people losing their jobs due to the economic climate: businesses close, move or downsize; or, people lose their job due to ill health. Both of these situations then leave them unable to pay their rent, leading to eviction. With an eviction on one’s record, it is very hard to find another place: many landlords now enforce policies that renters must be eviction-free for a number of years. This leaves many people facing homelessness, with very little help in finding housing. 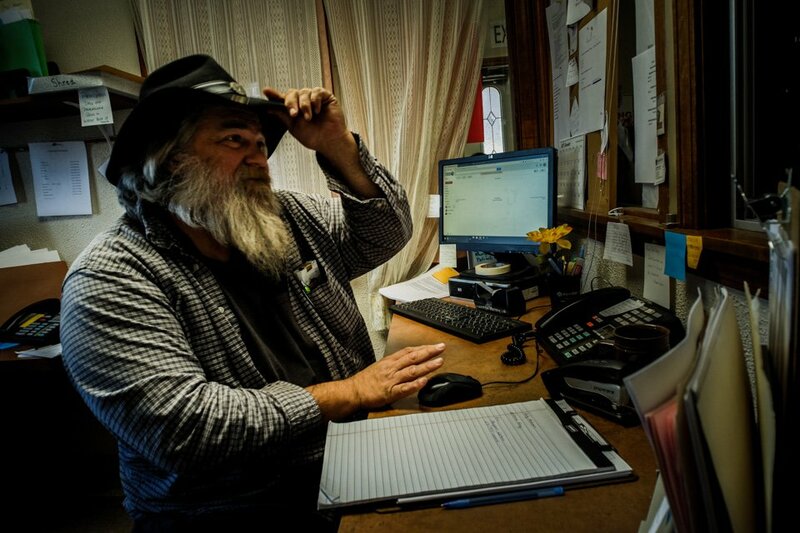 Cowboy works with Community enCompass to get people into the housing system and connect them to needed resources. 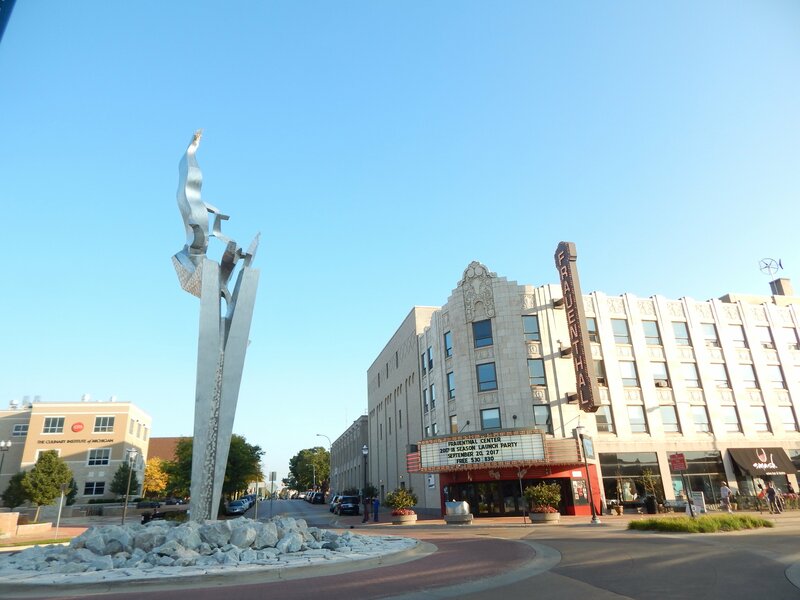 In his work as an outreach coordinator in Muskegon County, Cowboy sees major issues that need to be addressed if homelessness is going to be tackled in a meaningful and systemic way. There need to be more locally situated jobs that pay a livable wage, decent opportunities to make a career, and more affordable quality housing. Story, photos and video by Pat ApPaul. 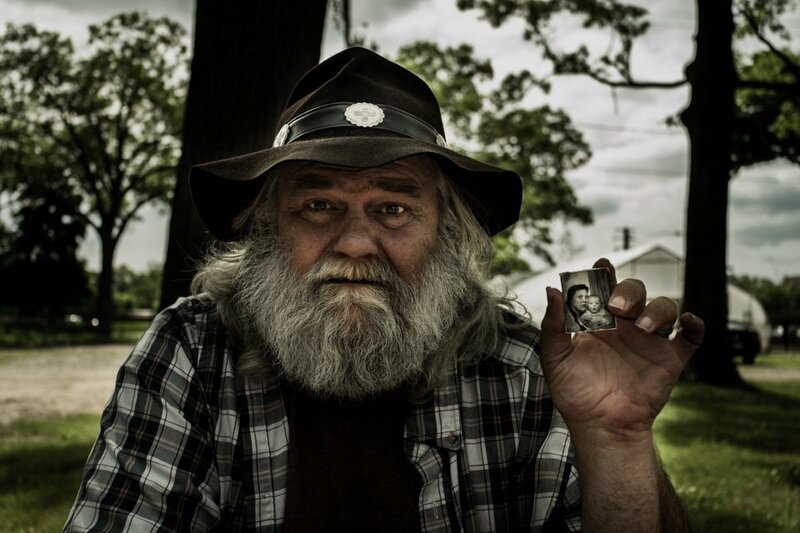 A documentary photographer from South Wales, United Kingdom, Pat is now based in Muskegon. He is interested in exploring and sharing the stories of people on the edges of society in West Michigan. Pat’s work can be found at www.PatApPaul.com, and he can be contacted by emailing Pat.ApPaul@gmail.com. Thank you for sharing not only Cowboy’s story, but allowing us the opportunity to hear his voice. His dream to see affordable housing and livable wages for all, while maybe even impossible as he says, is certainly still a dream worth fighting for. Thank you Cowboy, for sharing vulnerably and honestly. And thank you Pat for capturing such a compelling story and person! Incredible article on “Cowboy”…..thank you for printing his story….a story told all over our city, state…..country. That was an amazing story! I was very impressed with Cowboy’s life ventures and outcomes. He is a Soldier in this Pilgrimage of life.